Manchester City's title hopes suffered a major blow as Liverpool gained some revenge for Sunday's League Cup final defeat with a deserved win at Anfield. City edged the game at Wembley on penalties but were distinctly second best against a fired-up home side. 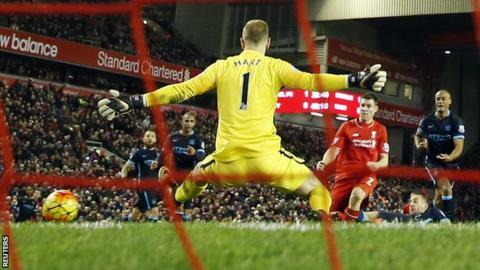 Adam Lallana's low drive gave Liverpool the lead before James Milner poked in a second against his former club. Ex-Red Raheem Sterling was taken off at half-time before Roberto Firmino fired in a third to compound City's woes. Man City are somewhat fortunate that leaders Leicester are the only one of their major title rivals to pick up a point in these midweek fixtures, but the defeat - their third in succession in the Premier League - means they are now 10 points behind Claudio Ranieri's side. City now also need to be mindful of the teams behind them. Manchester United are level with them on points after their win over Watford on Wednesday, while West Ham, Stoke and Klopp's side are among a group who will not have given up on a top-four spot. In the aftermath of Sunday's shootout defeat at Wembley, Reds boss Klopp declared that "only silly idiots stay on the floor and wait for the next defeat" and promised his side would "strike back". They did just that with a performance more in keeping with the high-tempo, high-pressing display they produced in their 4-1 victory at Etihad Stadium in November. From the kick-off they harried City, snapped into tackles and sought to push forward at every opportunity, with Lallana and Milner particularly energetic driving forces. It was apt that the two midfielders were responsible for putting their side in control before the break, with Lallana getting the ball rolling courtesy of an opportunistic, perfectly placed long strike before Milner drove into the box to collect Firmino's pass and finish. The Brazilian then turned goalscorer, finishing from inside the box to give the Reds their first league win at Anfield this year and move them up to eighth, six points behind fourth. City's hopes of adding the Premier League title to the League Cup are dwindling fast. They have dropped 13 points from eight games this year and have won just two of their past 10 away games in the league. More worrying is the tame way some of their players surrendered at Anfield - in the face of opponents who, by their own manager's admission, are not challenging for the title but who still showed greater desire. Sergio Aguero was a willing runner in attack and David Silva tried to get involved, but Jesus Navas was anonymous and Fernando and Fernandinho were bypassed time and again by a more energetic home midfield. They managed only four shots during the entire game but the closest they came to a goal was an Aguero header that Milner blocked on the goal-line. Pellegrini was emphatic in his backing for Sterling in the build-up to this game, stating he had no doubt that the winger would cope with the pressure of his first Anfield appearance since leaving to join City last summer. The Chilean was equally decisive with his response to the winger's woeful first-half display, withdrawing him at half-time and replacing him with the equally ineffective Wilfried Bony. The home fans booed Sterling's every touch, but as he only made 33 of them - none of which was in the box - during the 45 minutes he was on the pitch, he quickly faded from the main narrative to become a minor sub-plot. Liverpool manager Jurgen Klopp, speaking to BBC Sport: "It was the best reaction I can imagine. It was how it should be. I said to the boys that we have to show that we want it more and from the first second on that was exactly the attitude. "I think this was the best pressing performance we have done. City had no time to play football. "For all Liverpool lovers, it was a great night. We have to take this moment, stay angry and strike back. We have lost a few points in games we should nto have so now we have to take them back. "Roberto [Firmino] deserved his goal. The way he is working for the team in the last few weeks is unbelievable." Manchester City manager Manuel Pellegrini, speaking to BBC Sport: "It is difficult to have an excuse but I saw the team was not recovered from the last week. We played Champions League and then the League Cup final and I saw the team was not fresh and Liverpool played better. "We didn't attack well and create chances and didn't have fresh legs to play like we can. "It seems like the Premier League continues being the same from the start and very close. We will continue fighting." Kolo Toure made his 300th Premier League start in this match - the first African player to reach this landmark in the competition. James Milner has now scored in 41 different Premier League matches and never lost - only Darius Vassell (46 games) has a superior record to this in the competition. Roberto Firmino has both scored and assisted in three of his last five Premier League appearances for Liverpool. There have been 37 goals scored in the last 10 meetings in all competitions between these two sides (3.7 per game). Sergio Aguero has scored just one goal in eight Premier League appearances in the month of March, despite playing 606 minutes. Liverpool are away at Crystal Palace in the Premier League on Sunday (13:30 GMT), while Manchester City host bottom club Aston Villa the day before (15:00 GMT). Attempt saved. Nathaniel Clyne (Liverpool) right footed shot from long range on the left is saved in the bottom left corner. Assisted by Emre Can. Attempt missed. Joe Allen (Liverpool) right footed shot from outside the box is just a bit too high. Assisted by Christian Benteke with a headed pass. Attempt saved. Wilfried Bony (Manchester City) right footed shot from outside the box is saved in the bottom left corner. Assisted by Vincent Kompany. Corner, Manchester City. Conceded by Jordan Henderson. Substitution, Liverpool. Jordon Ibe replaces James Milner. Delay in match Jon Flanagan (Liverpool) because of an injury. Attempt missed. Jordan Henderson (Liverpool) right footed shot from outside the box is close, but misses to the left from a direct free kick. Christian Benteke (Liverpool) wins a free kick on the left wing. Substitution, Liverpool. Joe Allen replaces Roberto Firmino. Substitution, Manchester City. Aleksandar Kolarov replaces Gaël Clichy. Substitution, Liverpool. Christian Benteke replaces Divock Origi. Jesús Navas (Manchester City) is shown the yellow card for a bad foul.